With the wonderful memories of yesterday’s visit to Nagatani-san’s in my heart, I left Iga this morning. From Iga, I first took a high-way bus to Nagoya. Then, from Nagoya, I was going to take the bullet train “Nozomi” to Tokyo. It was just past noon when I got to Nagoya, so I decided to have lunch there. I went to a small “kishimen” noodle restaurant. 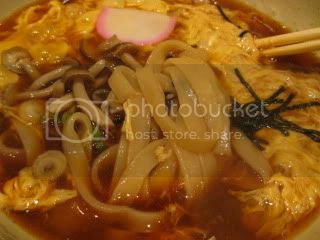 “Kishimen” is the name for flat udon noodles and it’s one of Nagoya’s specialties. This noodle house was so busy and there was constantly a line in front of the enterance during the lunch hours. But, most people are there for a quick meal, so the wait was short. I had the Kishimen Tamago-toji (hot kishimen noodle with the fluffy egg). It totally hit my spot! The noodle was so smooth and the egg on top was perfectly cooked to the very soft stage. There were so many “salarymen” (businessmen) eating there and they eat really fast. I mean, really FAST. During my 15-minute battle with the hot noodle, 3 different guys came to sit next to me and each guy finished the whole bowl and left! Yeah, that’s so hard-core salaryman style!